Anyway, I was looking for a piece of AV gear and decided to try my nearest Best Buy which I found via Google Maps and then took the opportunity to use navigation to get there. I’ve got GPS in the car already, but figured a live test would be good … and as my GPS in the car has maps that are 5 years old, I thought I might have better luck. Navigation started right away and the audible directions were clear if not a bit robotic…. to be expected. When it seemed like I was there yet with no sign of the store, I thought something might be wrong. I tried my iPhone’s Google Maps which also reported (to be expected) the same information and eventually had to fall on my manly pride and ask for directions. The address info on the map was completely wrong and while GPS steered me properly, there was no way to find the destination. On the way home, I again used the phone to navigate even though I knew how to go … this time however the route plotted was a bit different than the way out and I lost connectivity a few times (AT&T) and as a result the navigation became confused. It wasn’t until my connection was restored that my navigation was again able to be used properly. Phones are fickle as GPS devices (still) required a live data connection even for plotted routed. Navigation systems are only as good as the data on the map. 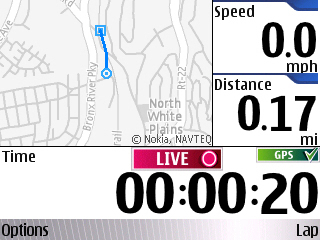 Today Nokia announced Maps with free navigation for everyone which is a very big deal. Previously the only way to get turn by turn navigation was to buy a Navigator device. Nokia had offered free trials of the navigation service on most newer mid to higher end devices but to put it all out there is a very powerful offer. When Google first announced Android 2.0 would include free navigation it was a bold move, and became an instant black eye for everyone else. Nokia’s initial response with the 5800 Navigation Edition was pretty limited by comparison while today’s play is substantially more bold! I’m sure this was not an easy pill for management to swallow given Navigation is one of the larger revenue generating services. Nokia’s reach and share is still larger than anyone else’s and I expect others to follow suit as a result. Consumers are now going to expect navigation as a standard feature of a smartphone – in the same way maps previously was. While this is hardly a definitive view, I think it’s an excellent example which highlights a key difference Â in how Nokia and Google have gone to market with very similar ideas. 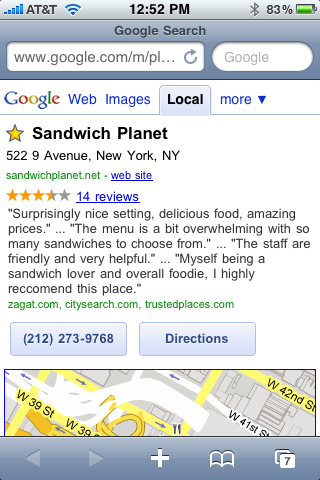 Ovi Prime Place and Google’s Favorite Places both seek to link physical businesses with mobile maps. Â The main difference and it’s likely to be critical here is that Google has proactively seeded 100K businesses with QR code stickers and listings while The Nokia Ovi team has decided to leave the map blank and invited businesses in to create their listings … Â without any marketing. Which do you think will grow more quickly and succeed? Thanks to Jaiku and GerryMoth I just learned about a new release of Sportstracker which offers a real map of your location as you track your progress.Â Previous versions showed a visual progress, but based on coordinates rather than a real map.Â i believe this is the first integration of Navteq data outside the Maps application and it is working really well.